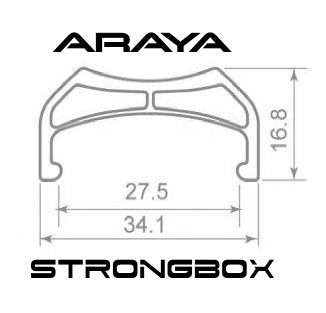 Arriving shortly is this ARAYA SIX50. Cross Country or Free Ride Disc Rim in 650B size (27.5"). Made from 6061 aluminium alloy with eyelets for added strength. Superb section for strength and initially available in rich black anodised finish with 32 holes. ARAYA 29E.R. Cross Country or Free Ride Disc Rim in 29er size. Arriving shortly is this ARAYA ﻿29﻿E.R.. 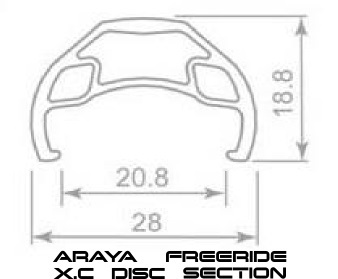 Extra Rigid, Cross Country or Free Ride Disc Rim in 700c/29" size. Made from 6061 aluminium alloy with eyelets for added strength. Superb section for strength and initially available in rich black anodised finish with 32 holes. Arriving shortly is this ARAYA 29 LITE. Extra Light, Cross Country Disc Rim in 700c/29" size. Made from 6061 aluminium alloy with eyelets for added strength. Superb section for lightness with strength and initially available in rich black anodised finish with 32 holes. 6061 HEAT TREATED ALLOY BOX SECTION WITH A CENTRE RIB. SUPERBLY WELDED RIM AND WE DEFY YOU TO SEE THE JOINT. GLOSS BLACK ANODISED WITH 36 HOLES.